Anxiety is useful. Essential in fact. It’s our radar. It gets us thinking about risks and challenges. It guides us around danger. So don’t get rid of anxiety before you check what it’s telling you. We can be braver when we have a safe base … a near-by Mummy, a trusted friend, a team colleague or just an inner self-esteem. As soon as we feel unsafe, then fear kicks in. It may only be losing your toddler in the supermarket. It’s still like life and death. It makes us cling, scream, fight, freeze or run to make things safe again. These fears and attachment patterns are almost as old as the hills. They are easily used and easily abused. In case you’re nervous already – it’s safe to read this blogpost. Excess unnecessary fear is easy to dissolve and protect yourself from. At the bottom is a list of positive self-help things you can do at any time you need to. Calming down is the reward for finding safety again. Calming down is also the quick reward for modern psychological help. 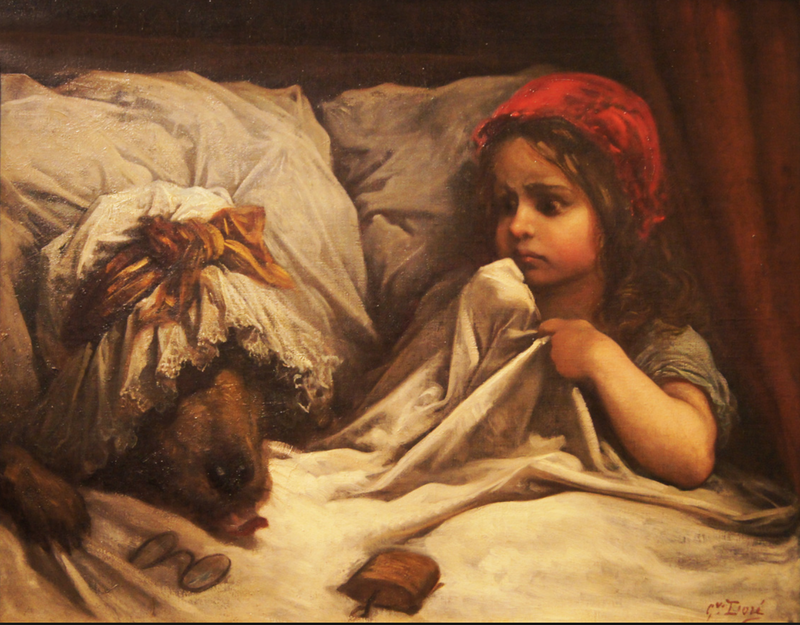 But – like Little Red Riding Hood (pictured) – even reassurance from your own granny may sometimes be suspect. 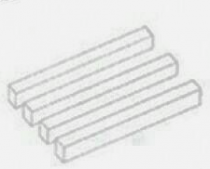 How do we know and teach the difference between these four situations: 1. Safe, 2. Risky, 3. Safe that isn’t safe, and 4. Risky that isn’t risky? This personal challenge is echoed through the ages at the highest levels too: How far should we surrender liberty for safety? Do we still have something useful to learn from ancient folk tales? That’s for later. First let’s see anxiety at work – risk, vulnerability, safety, reconnecting. And also how coercive people can employ fears abusively. … If you’re sitting comfortably, let’s begin. Children are most open about their fears and their attachment to safe familiar people. Adults tend to cover it up. But we all have the potential in us to be a scared or vulnerable child. Exactly the same strategies are triggered in adults as in children. Adults have anxiety disorder and phobias. How it works is as clearly seen in adult intimate relationship problems as it is with children. Adults’ couple relationships can get just as stuck as they can with children. But, with or without help, these relationship problems get back to safety as the scared vulnerability held beneath the attachment strategies is carefully uncovered and calmed. This happens in many forms of couple therapy. But it is most explicitly the basis of Emotionally Focused (Couple) Therapy. See more about EFT here. Love Sense: from infant to adult is a great little video with Dr Sue Johnson and Dr Ed Tronick. Love Sense is the best 10-minute teaching about the whole of attachment theory and therapy. They talk through and show captioned video of the basic attachment strategies and reconnection in action. They look at a parent and baby (the Still Face Experiment, see below). And they look at an adult couple doing the same things. … And of course it’s very easy to spook a child; to tell them there’s a monster in the cupboard that’s going to eat them up. And when this happens in play, you can reverse it back to normal. But if you don’t reverse it: even (or especially) a person who was previously trusted might be sustained as a very dodgy, avoidable one. Natural life events can make you rightly scared at the time. Getting out of your depth when swimming, being jumped on by a happy dog, seeing someone have a nasty accident, your loved one or parents not turning up when they said. It’s no surprise that experience sensitises and sets you up for more anxiety for repeats in the future. If you’ve had far worse scary experiences, then you may be more traumatised. You may be left with a kind of well-worn nerve-circuit that goes off with the slightest trigger as if it’s happening again. Plus you have all that terrible undiluted fear running through your veins as well. Now it becomes more of a phobia or a post-traumatic stress syndrome thing. It has a life of its own. The worst kind of spooking – for children or adults – happens when the situation is rigged. Maybe it is sustained over time. Maybe repeated in secret by people who are trusted and meant to be safe. Child abuse is well known and well-covered elsewhere. Read the stories on the NSPCC website – e.g. Gareth’s story … “I was really scared”. Watch the video on how good and bad early experience shapes children’s brains and future. Look at all the NSPCC’s work on awareness raising and prevention. Those are stories where the fear is of something real. Sometimes the fears are unjustified but everyone around has joined in the spooking. How can a child – or an adult for that matter – avoid feeding off it too? Maybe no one really intends to create excess fear, but serious spooking gets a grip. Intended or not, the outcome is emotional abuse of the child. This trailer for the film Jake’s Closet shows some dramatised spookery. In the film, the spooking isn’t calmed and reversed as this fictional scenario eventually does. It grows into Jake’s major fear and rejection of his once-loved and still quite safe and loving parent. See this review of Jake’s Closet where the reviewer gets that this horror story is called Parental Alienation. That is a horror story that happens all too often in real life and in plain public too. This use of spooking can be done unwittingly. And it can be done quite consciously. Of course, the most well-known abusive use of fear is in the coercive control of domestic or intimate partner abuse. We can be brief here and point to numerous other rich resources … starting with the BBC radio soap opera The Archers: An everyday story of coercive control and child alienation. Here’s the BBC page about Helen’s trial. Scroll down that page for audio excerpts. 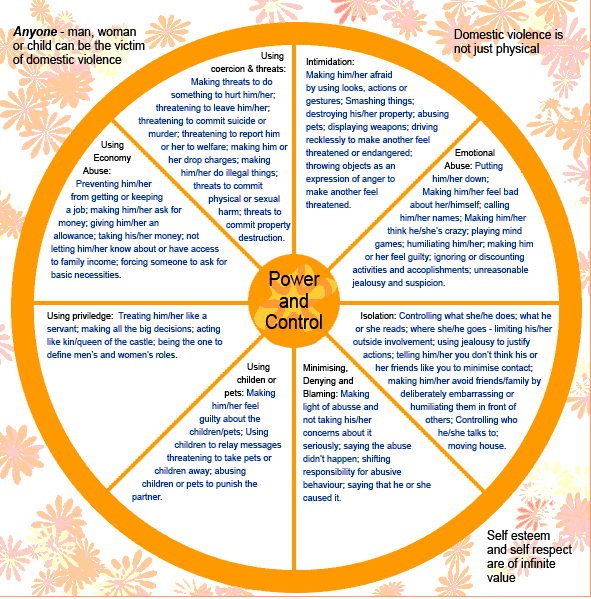 Since the 1980s the Duluth Power and Control Wheel is the most widely used diagram to show what coercive control looks like for couples. It includes fear-inducing intimidation, emotional abuse, threats and isolation (aka alienation). Originally dedicated to women victims of male violence, the Duluth wheel here is a more recent one that recognises – as this page lists too – that domestic abuse is gender inclusive. Many mainstream movies feature domestic abuse. ‘Gaslighting’ – from the film Gaslight – is a famous way to spook someone. These short videos give a dramatised picture of the terror – Living on eggshells, and Domestic violence, coercive control. The Archers storyline coincided with the new law (in England and Wales) against controlling and coercive behaviour. Coercive control was most fully described by Evan Stark (2009) in his book of that name. Fear is plainly in the control tower. Rightly coercive control has a central place in understanding what is most abusive in intimate partner abuse. There are unique features in each case and in that special gender-based application of the concept. But the coercive pattern is also very much the same as generally found in all the other kinds of coercive patterns of undue influence. And that wider perspective throws more light back on coercive patterns in families. In harmful mind-control cults, there is a much more intentional induction of fear and phobias. Watch Steve Hassan presenting on ‘Releasing the bonds’ of phobias (10 mins). And take note in that video of the long list of other mental health disorders that members and ex-members of cults suffer. His BITE model stands for the coercive control of Behaviour, Information, Thought and Emotion. So, you might ask, what if you could resist your normal capacity for attachments to others, block off your fear and phobias? Isn’t that even stronger than calming techniques (e.g. below)? Blocking anxiety and normal reactions might be really useful? Well it is useful. But, notice that you would be cutting yourself off from your normal human functioning. The ‘mind-control’ begins to be more than just calming down. You won’t be surprised, then, to know that training to block normal reactions is most useful to cult-leaders and others who deal in harmful coercive patterns and Undue Influence. This training is to entrap you more deeply. So yes, it is possible to train people to block normal fear and phobia induction. Scientology does this most explicitly. Here’s the full list of their TRs (Training Routines). Watch this YouTube for a brief demo of what the TRs look like. The demo takes minutes. In reality these TRs are repeated over and over and over for many hours and days. The Scientologist is convinced they’re getting stronger and wiser – ever closer to becoming one of the chosen few. But actually the person is being fooled, into a science fiction, into losing their mind and their life. For the fullest descriptions of how cults operate and how to help a loved one in them, read Steve Hassan’s books (e.g. for phobias, read Chapter 10 in Freedom of Mind: Helping loved ones leave controlling people, cults, and beliefs; see more in FreedomofMind.com). Dr Josh Durham’s talk below is a good summary (in 30 mins) of the whole BITE model as applied to his experience of the Mormon or LDS (Latter Day Saints) Church. In the talk he describes all the features in his experience of ‘LDS’ being a mind-control cult. Watch Josh talk from 21-24 mins to hear him describe the phobias and fears they induce. For your interest, the Wikipedia page on this ‘church’ has been prevailed upon to make no mention of the utterly incontestable facts about how it operates. Such is the power and reach of organised cults. They can even control what external public information like Wikipedia tells us! So you should, by now, have a picture of how anxiety, fear, and attachment are useful: natural, good for us, essential. You’ve seen how fear can breed more fear and turn into phobias. You’ve seen how our closest relationships are our original and lifelong safe base. You’ve seen how that can itself create patterns that may only make the problems and insecurity worse. We’ve seen what reconnection looks like and how ethical therapists help people back to calm safety. Ethical relationships do not try to fool you that risky things are safe, nor that safe things are a risk. And we’ve seen how those with unethical and coercive purposes can use all the same steps to try to fool us – if we’re unprepared – into mistaking what is really safe and mistaking what is really risky. They try to fool us into clinging to the most unsafe relationships of all. And they abuse spooking and fear and phobia to mind-control us. They turn us against our authentic self, and against our natural relationships with those who genuinely love us. That last bit is also called alienation. By now you may want to hear some more about how anxiety can be useful. Apart from the radar functions of fear and its role in close safe relationships with our loved ones, what (you ask) might be a positive use of fears and spooking? The clue is in the Little Red Riding Hood picture at the top. The lessons lie in her extremely valid questioning about her granny’s voice, eyes, hands, teeth and mouth. For hundreds of years, she has shown us how to do all the right things. Except for one thing: She trusted a false granny for the answers. But the topic of ‘education for prevention’ is far too big and interesting to tag on the end of an already long blogpost!! So that’s quite enough for now, dear readers. It’s time for you to go to bed. Next time we’ll read another exciting chapter. And we’ll look at lots more stories that teach us important lessons. Watch this space. See you next time. Mindfulness and yoga are good, but they take space, time and learning to do properly. These self-help things don’t. They have all been tried and tested by yours truly! Write your thinking down – e.g. if you wake in the night, don’t toss and turn – get up and put your thoughts down. Don’t send them to the person you want to say them to until you’ve checked them the next day. But keep doing those that make you feel good – going into work or recreation can be better for you than staying home. I’m always glad to see an expanded anything from PA. PA is not unique, new or something only “our” cohort knows about. The problem is that there are so many silos with their own language that it is impossible to make any comprehensive or systematic headway. Even the APA’s right hand doesn’t know what it’s left hand is doing. It’s maddening. But I digress. The Duluth Model also has “post separation” and coercive control wheels which includes using the kids in exactly the same way that you define pa. The element of the post separation wheel that I like is that incorporates how institutions, like family court become part of the problem instead part of the answer. I’ve been teaching targeted parents about trauma and the neuro-chemical and physiological changes in the brain from prolonged psychological violence (emotional and verbal abuse). Targeted parents have the same symptoms of emotional dysregulation, loss of trust and direction as well as cognitive impairments such as begin able to separate relevant information from irrelevant. The jury is in, the best treatment for psychological trauma is neurofeedback, with Internal Family Systems and EMDR taking second. More visceral therapy is the up and coming contender. If we could all just speak the same language, we could end the severe cases and intercede in the others. Glad to see you still out there making waves.